Inspired by the needs of local children in the Dominican Republic, the Cigar Family Charitable Foundation spearheads a humanitarian project funded partially through the donations of American cigar enthusiasts. Carlos Fuente Jr.'s voice cracks with emotion as he speaks to the crowd gathered at the Grand Havana Room in Manhattan on a chilly evening last November. On this night, the ritzy private cigar lounge is one of 114 cigar shops and lounges spread throughout all 50 states that are collectively celebrating the world's largest cigar toast, raising funds to benefit the Cigar Family Charitable Foundation (CFCF). The organization, created by Fuente and operated in conjunction with the J.C. Newman family, is currently developing much-needed social, medical, and educational facilities in the Dominican Republic town of Caribe. "Carlito" is the master of ceremonies for this far-reaching fundraiser which, on this single evening, has simultaneously brought together over 5,000 cigar enthusiasts, entertaining them with wine, fine dinners, music, auctions, and an exclusive cigar tasting. Fuente, president of Tabacalera y Fuente y Cia of Santiago, Dominican Republic - the company behind the Fuente Fuente Opus X and other highly sought-after cigars - could scarcely be prouder. 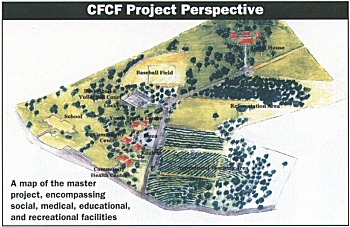 In 2002, CFCF purchased 23 acres of land to develop the Cigar Family Community Complex in and around the area of Caribe. Their partners on the project are the Instituto Dominicano de Desarrollo Integral, Inc. (IDDI), a non-profit community development organization founded in 1984 that collaborates with the Dominican government, and national and international corporations. 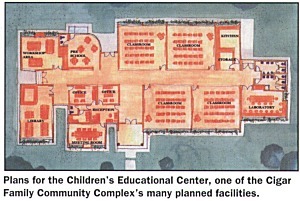 Fuente is quick to point out that, unlike many charitable organizations throughout the world, all of the money raised by the CFCF is spent on charitable purposes. All administrative, legal, accounting, office, website, and marketing costs are underwritten by the Fuente and Newman families. The CFCF Complex, which will be adjacent to the Chateau de la Fuente tobacco farm, is the culmination of the organization's goal of addressing the humanitarian needs of the people of the Dominican Republic. When completed, the complex will encompass a sports complex, medical clinic, school, adult training center, and youth recreational facility. Fuente, a Cuban-American by birth, has lived in the Dominican Republic since 1980, and has seen firsthand some of the enormous hardships that the Dominican people have endured in their daily lives. In the five communities surrounding the town of Caribe, for example, most children have limited access to a primary school education. Many do not attend classes due to lack of classroom space, and others enter school at a late age; an astounding 74% of the population between 6 and 18 are still in primary school. There are, in fact, no secondary schools in the area. The CFCF's school projects include the construction of new schoolrooms, a kitchen and cafeteria, and a new potable water supply for the schools; the purchase of supplies including books, uniforms, desks, and blackboards; the creation of school-based agricultural projects; and the building of an adult education center. Health care issues also plague the area, primarily an appalling lack of safe drinking water. The lack of plumbing forces residents to collect water from unsafe sources; Dominican children often walk for miles to collect water from the nearest river. In response, the CFCF is constructing a new potable water supply system, building wells and installing pumps, and instituting water filtration and storage systems. Other health initiatives include preventative health care projects; projects aimed toward pregnant women, newborns, infants, and toddlers; providing health centers with medical equipment, medicines, and furniture; and the construction of the community's first and much-needed medical clinic. Sports, and especially baseball, are also important to the youth of the Dominican Republic. Another stated objective of the CFCF is to organize youth groups to participate in diverse activities such as sports, recreation, civic programs and reforestation. Plans call for the building of a new baseball field and basketball court and to organize and equip teams for both. The CFCF also intends to deal with general quality-of-life issues by installing new electric lines to provide dependable power, and building and repairing roads and access ways. Back in New York, as 7:00 EST rolls around and all speeches are concluded, the guests at the Grand Havana Room, along with the rest of 5,000 cigar enthusiasts across the U.S., raise their cigars to toast the people of the Dominican Republic. However, it's not just any cigars they're holding up. As befits such an exclusive occasion, the cigars themselves are rare treasures - namely the Fuente Fuente Opus X and the Diamond Crown Maximus, each in an unreleased, commercially unavailable CFCF commemorative edition. By the end of the evening, over $250,000 has been raised for the Foundation, an impressive achievement. "Our dream of creating a community complex for the people of Caribe is well on its way to becoming a reality," said Newman. Fuente, who is visibly pleased by the culmination of his dream, adds, "This toast gives us all a chance to pledge our support to the people of the Dominican Republic, who have given their hearts and hard work, with their hands and soil, to provide us with the best cigars in the world." Those interested in making a contribution can do so by contacting the Cigar Family Charitable Foundation. The charity is a 501 (c) (3) charitable tax-exempt organization, and your contribution is fully tax-deductible to the extent provided by law. 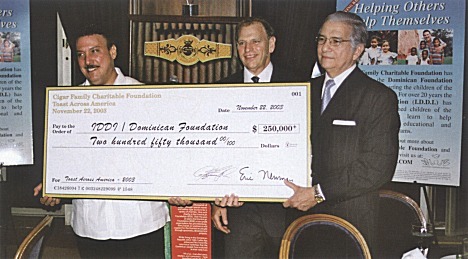 Cigar Family Charitable Foundation, P.O. Box 2030, Tampa, Fla. 33601. Tel: (813) 248 2124. Fax: (813) 241-8275. E-mail: CFCF@cigarfamily.com.